Bishop Kwangu and his wife Mary took Fr Francis and Brother Nathan southwest across the bay and through the valleys for around 100 kilometers to the town of Geita, where Fr Francis was to teach for two weeks at Christ the King Anglican Church in the center of the town. It has been decided that Geita will become a separate diocese in the future and the teaching fosters that goal. Fr Francis teaching in his "outdoor" classroom. Geita has many churches and few clergy. Most of the churches are led by evangelists, commissioned to lead the churches and the Sunday services. They do much more than just preach the Word; they lead the congregations; they are the pastors. Most are not formally trained but do the best they can. In the past, OFM teaching has been highly successful in such areas. Bishop Kwangu and his wife and Brother Nathan returned to Mwanza to carry on the teaching of the evangelists back there, leaving Fr Francis in Geita. The schedule in Geita: classes every day, Monday through Friday, 8 AM to 5 PM. Rest day on Saturday. Worship at all three services on Sunday, 8 AM, 10 AM and 4 PM, usually preaching or teaching. Over twenty students were expected, but only thirteen showed up initially. The second day, three more students arrived and one student was never seen again. Travel is not easy for the poor people of Tanzania. They are interesting people. Who are the students? All lay people in parish ministry, mostly evangelists, who lead a congregation, and some choir leaders (an important ministry) . Their occupations were interesting: two miners, three farmers, a fisherman, a tailor, a bicycle taxi driver, a first grade school teacher, two singers, and a business woman. Ten men and five women. Ten new students and five who also attended in 2009. 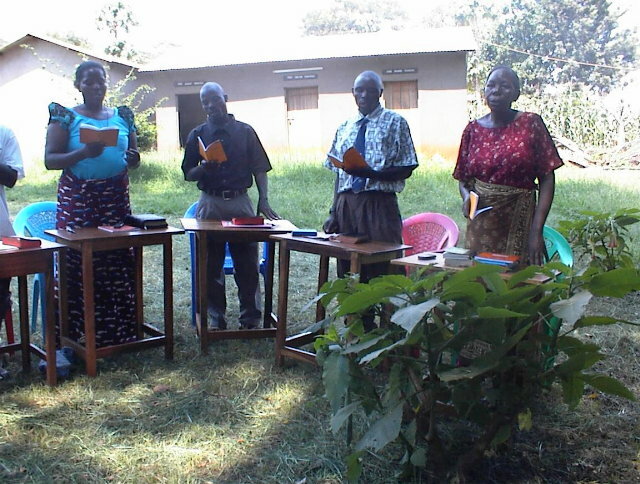 One person attended but did not complete, bible college in Nyakatto where Brother Nathan is teaching, and the rest attained primary grade five or primary grade seven, except for one man who never attended a day of school in his life. No high school students or graduates. Very attentive and participative. They write many notes in their study books. There are no students who wear glasses. No one in Nathans class wear glasses either. Fr Francis has missed a day of teaching – sick with stomach distress. Such ailment is a part of life in Africa. The treatment – treat it right away – take appropriate medicines quickly – so it does not drag on for days. Medicines include pink bismuth tablets, Immodium D, and ciproflaxin. He was down for 36 hours. Oh, by the way, the song printed above which was sung at the first class is the Swahili rendition of “How Great Thou Art” using Swahili words but the same melody that we know. Try it out. Going on at the same time as classes in Geita were other classes at Nyakatto Bible School in Mwanza, taught by Brother Nathan Dunlap. He taught a large group in the big classroom there, his students numbering around twenty-two. Nathan was assisted by his interpreter, Pastor Danson, a young energetic priest, recent graduate of St John Seminary in Dodoma. 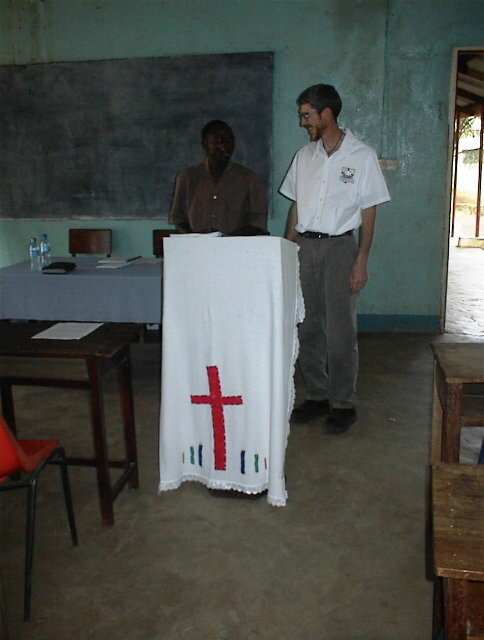 Years before, Pastor Danson had worked with Fr Francis on his first trip to Mwanza. After some searching around, Nathan was billeted at St Dominic Catholic Conference Center in Mwanza. The Conference Center is run by Dominican Sisters under the Catholic Diocese of Mwanza. What a blessing – hot showers, community cafeteria, real toilets – not so in Geita! Nathan’s students had many questions about the beliefs, teachings and practices of the Church. Sometimes, they had learned incorrect things about what the Church taught. Sometimes they understood things differently even when it was correctly taught. The combination of lecture and seminar style teaching works well in Africa. There are blackboards in the classroom, but they are made of a type of slate that requires a wire brush to erase the writing on the board. OFM uses dry erasable white boards, approximately 18” x 24” to help teach the information. Nathan responded to a question on applying Scripture to daily life and was surprised when they all stood and applauded when he finished. 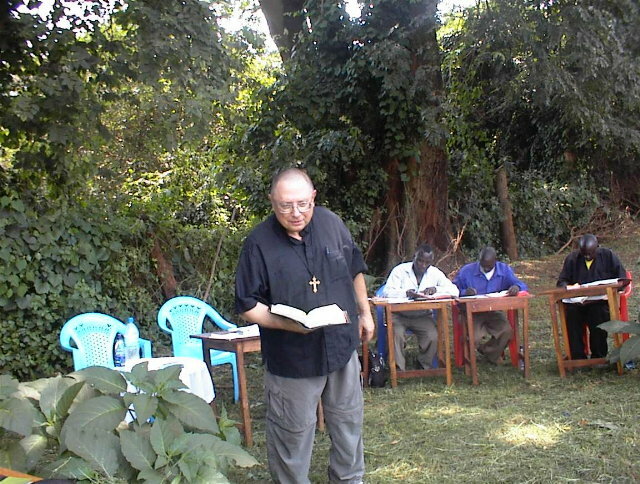 Thursday was an intense day of teaching for Fr Francis in Geita. He finished the teaching on the beliefs, teachings and practices but not before having to visit divorce and remarriage, birth control, and inter-communion. He hesitated to speak with knowledge and authority because the policies of the Anglican Church of Tanzania were not known to him or the students. Pastor Mathias came in and helped with his knowledge of the teachings of the Anglican Church of Tanzania. Evangelical Anglican African theology has some different viewpoints. It is good that Fr Francis did not speak on those subjects. Yup! The lack of electric power was a continuing hindrance to the teaching program in both venues. The high temperatures were also a continuing problem. But teaching continued unabated. Saturday is a day of rest. Sunday is for worship and fellowship. We are so grateful to all of you who supported this teaching trip to Africa. The students are also grateful. Things are going well and we always pray blessings on our benefactors in class.